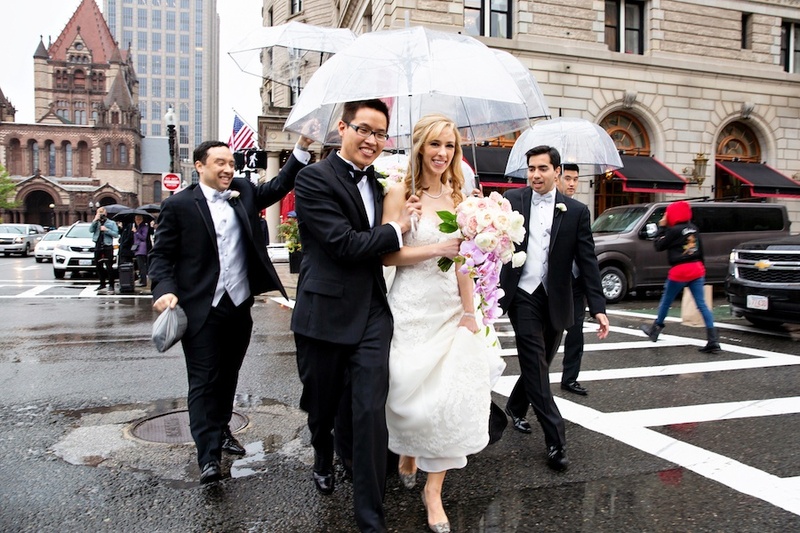 Step inside their orchid-filled spring wedding at the Boston Public Library. 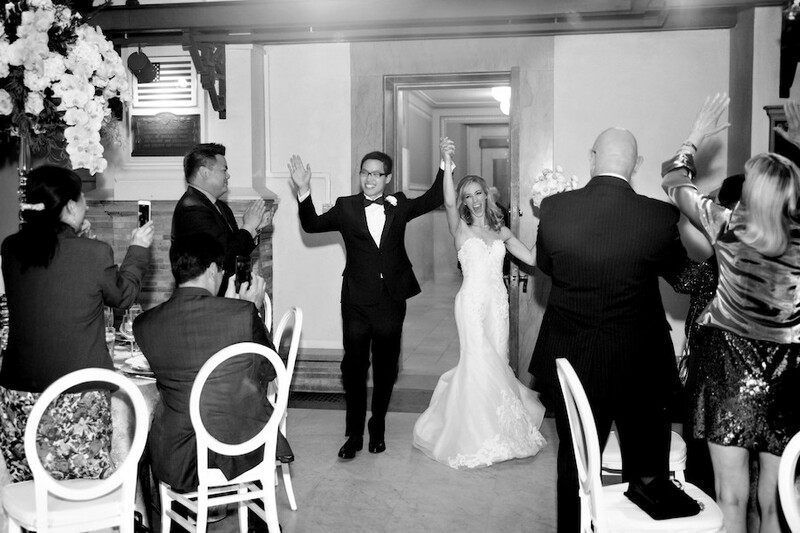 By Rachel Kashdan·	 12/6/2018, 3:59 p.m.
Laura Schneider and Mike Hsu almost never became Laura and Mike. In October 2012, they were both living and going to school in Pittsburgh when they were invited to a birthday party by a mutual friend. Laura, now a lawyer, had midterms coming up and planned to stay home to study instead. “I wasn’t even going to go, and then my friends were like, ‘You have to come!’” Laura recalls. “I decided I’d just go for a little bit, but then ended up staying the entire night.” After the pair met at the party, they added each other on Facebook and went out on their first date a week later. On that first date, they talked about the number one place they each dreamed of traveling. For Laura, that place was Maui. Four years later, Mike suggested they take a trip there. Before they left for their trip, Mike packed four signs in his suitcase, each displaying one of four words: “Will,” “you,” “marry,” and “me?”. Throughout their trip, Mike slyly took photos of himself holding up each of the signs behind Laura’s back (once while they were scuba diving). “I had no idea,” Laura says. He proposed by showing her the photos on an iPad before getting down on one knee holding the “me?” sign. “The funniest part was he’d only had a sign reading ‘yes’ made,” Laura laughs. 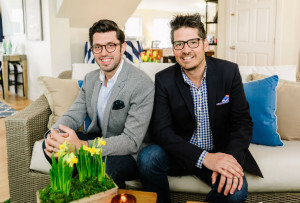 The couple started planning their wedding while living in Boston, where Mike—a physician—was finishing up a residency at Boston Medical Center before the couple moved to Los Angeles in summer 2018. 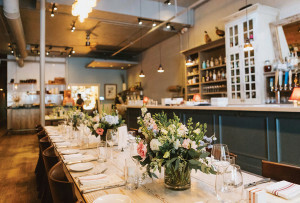 “We knew our wedding was going to be our last big hurrah in Boston, so we wanted a place that would be really fun and easy for us to plan,” Laura says. 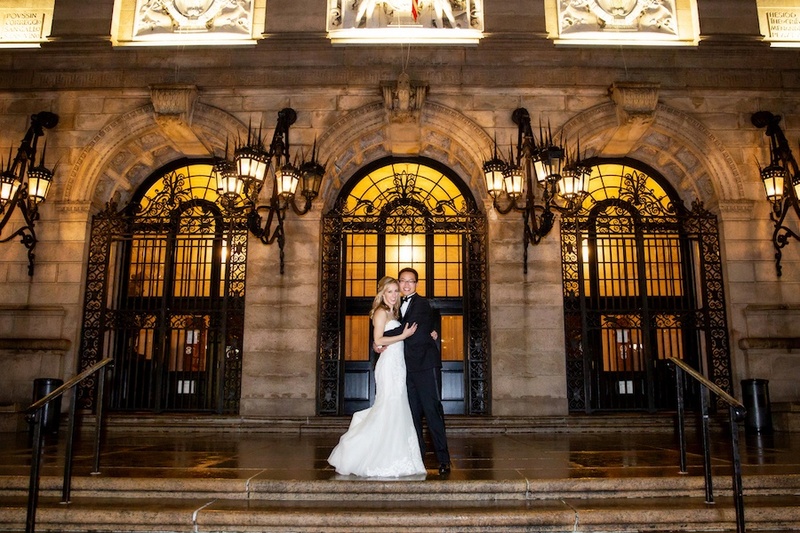 That place was the Boston Public Library, the only venue the couple visited. 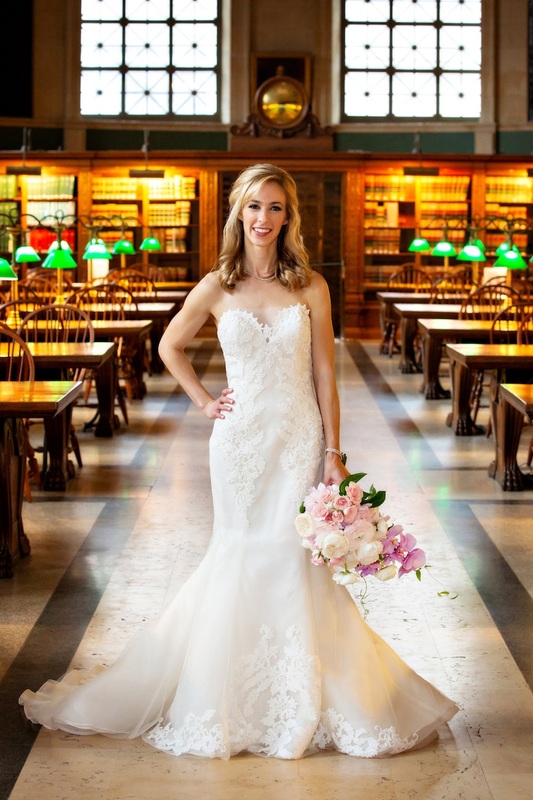 “We loved that it’s a really easy one-stop-shop venue, plus both of us have spent our whole lives in libraries, so it only seemed fitting that we’d have our wedding in one,” Laura explains. 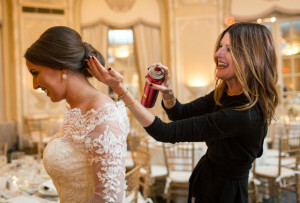 Laura’s Ines Di Santo gown, which she found at L’élite Bridal Boutique while shopping with her mother, was the second of seven dresses she tried on. “I knew what I wanted: something fitted with lace detailing,” she says. 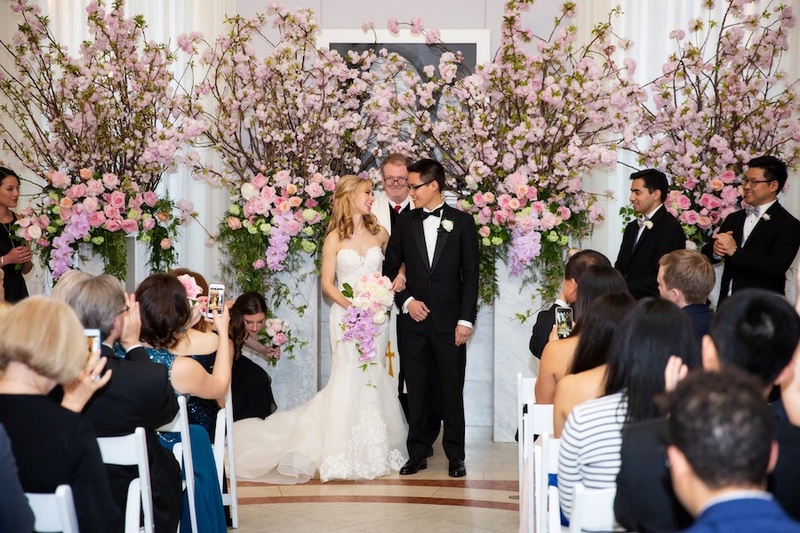 The couple dressed up their ceremony space with cherry blossoms, orchids, peonies, and roses. 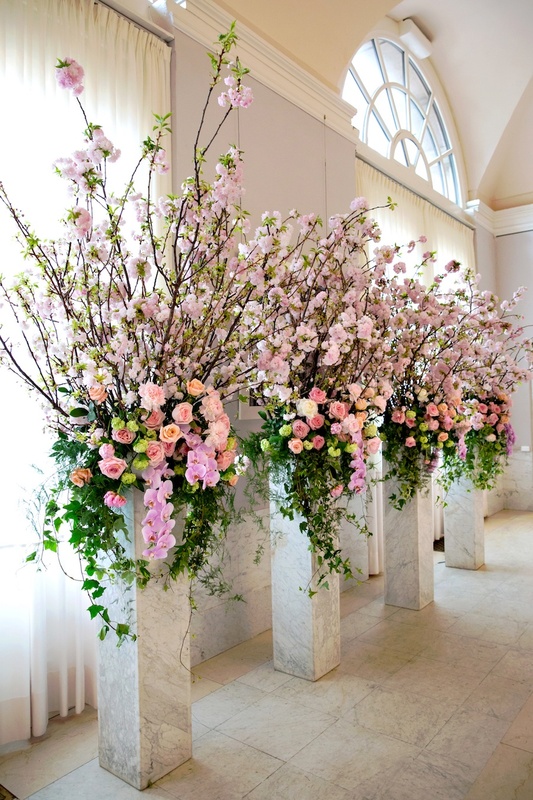 “I loved how the cherry blossoms had kind of a firework-like, celebratory look. They made it feel very grand,” Laura says. Laura’s close family friend, Steve, officiated the couple’s ceremony. “My dad passed away when I was younger so having one of his best friends officiate made him feel like more of a presence,” she says. 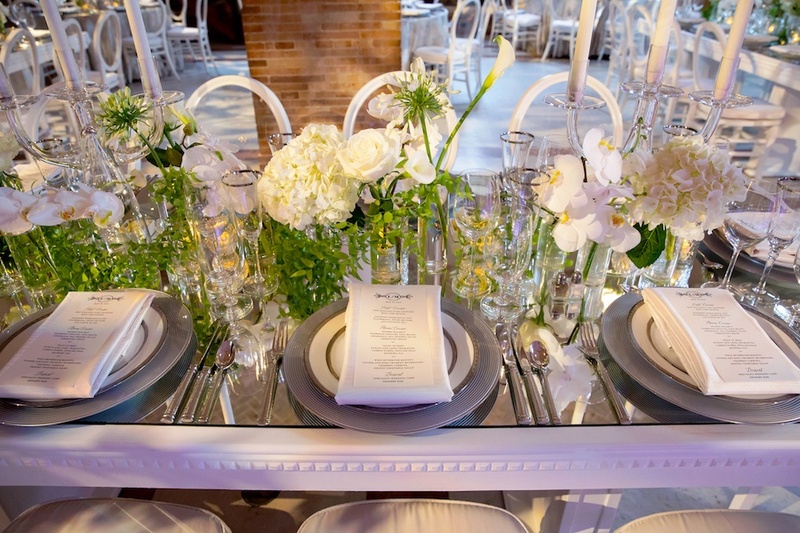 “Orchids are one of my favorite flowers, so I told my florist I wanted tons of orchids throughout,” the bride says. 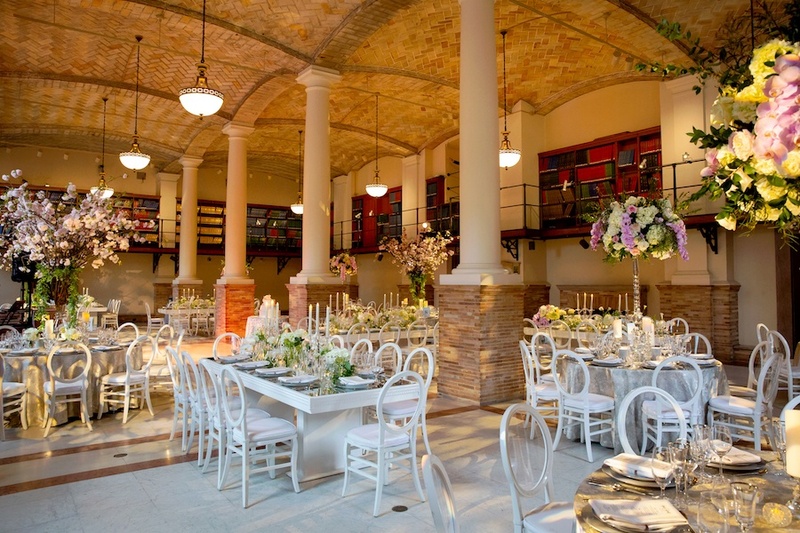 The reception took place in the library’s vaulted Guastavino Room, which florist David DiCicco filled with ample blooms. 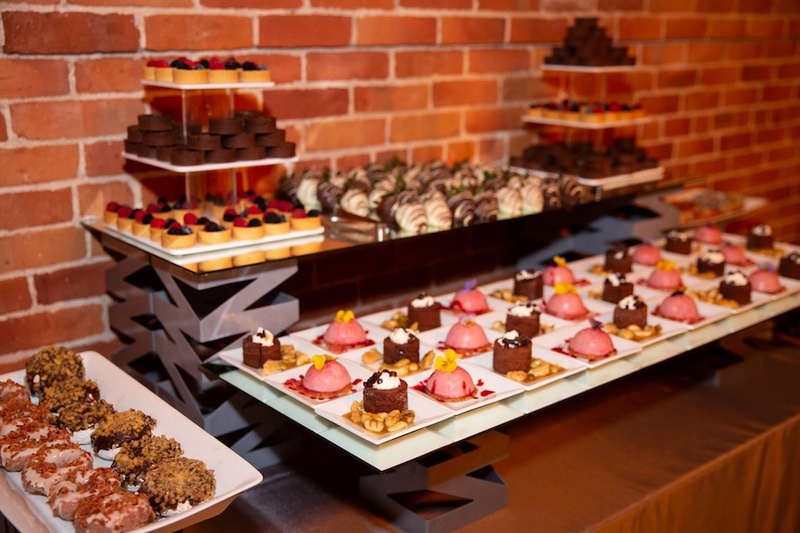 In addition to their wedding cake, the couple’s reception featured a dessert bar with berry tartlets, doughnuts, chocolate-covered strawberries, and more. 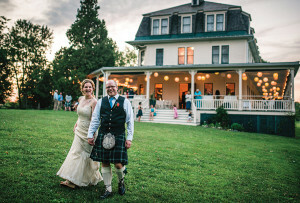 “My top wedding-planning priority was dessert. I wanted there to be something for everybody,” Laura says. Hair Lindsay Griffin + Co.